I’m talking about feeling manipulated or used in your life by others. Do you over-give and over-accommodate in your relationships? Are you drawn to people who have high expectations of what you should be doing to them (and you go along?) If any of that sounds familiar, let’s talk about why that might be and how you can change those patterns of behavior. Another key thing is realizing the difference between being needed and being taken advantage of. Do you consider yourself a helper, do you like being needed and helping people? There is a big difference between being truly valued, desired, and needed and being USED. We have all had relationships in our lives with people who have taken advantage of our kindness or who have seen it as a weakness to exploit. These are people who will continually try to get you to do something that benefits them, even if it is not in your best interest. Manipulative people are sometimes not consciously aware of their behavior. There is a technique where you mirror their unreasonable request or selfishness back to them. Repeat their request back to them starting with “So you are asking me to….”. Be firm and ask them if they think their request sounds fair. This will also make it clear whether this a request, or whether they are just expecting you to do whatever they say. Our intention with this technique is to hopefully make them aware of their manipulative behavior, f they are not already. No is not a four-letter word. As always, take care of you! PS. And ladies, it’s that time of year again!! The Real Love Revolution season is upon us so please click here to join our private FB group where I will be live to answer your Q’s on February 28th and get free gifts!! This is so useful! 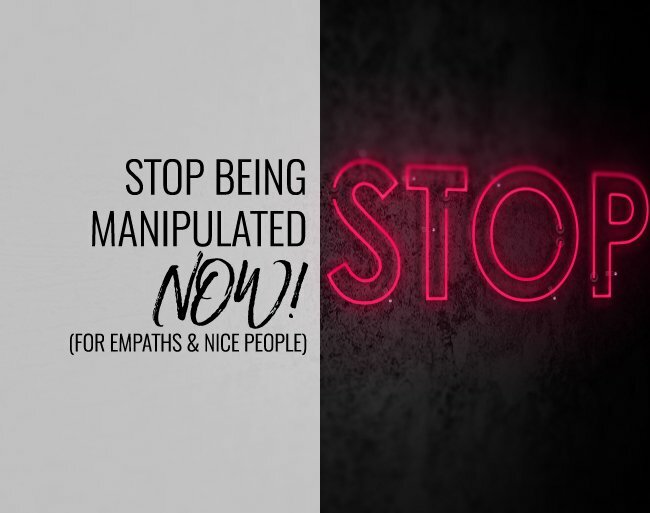 I’ve been very prone to manipulation since I’m an empath, and these tips, especially mirroring the question back is really great. Thanks! Wonderfull! Your language is so clear, I am German and my English is not very good, but I understand you completely! thanks so much for this! I would love an episode about older siblings and how to set boundaries with them. Thank you for your blogs. They are always so full of valuable information.I wish I could be at the point where NO felt really comfortable to say. Walking towards that goal. You are so welcome and I am so grateful you are here with us! I am cheering you on like a wild maniac!! As always, great video Terri! My mom is a narcissist and dealing with her can make me question my own reality. The idea of a 24hr policy is so very useful. I wonder what mirroring back would sound like, because I think she would just say no I was saying… insert new more convenient narrative, and then find a way for her to feel like a victim because I didn’t agree with her. Is there a way around that? Also thank you for your blog. It has been very empowering for me to learn from listening to you. I am so glad the content on the blog is resonating with you. When someone bold face lies (which is what you are describing)- it is difficult to act like they didn’t-the key is to not react to the best of your ability and honestly consider limiting contact to protect yourself. Any back and forth you get into with her, you will most likely lose if she is a true narc-because rules don’t apply to them in their mind-which means nothing is off limits as winning and getting their way is the end goal. Thank you Terri for your clear and concise words! I am still struggling on the ‘No’. When a friend asks me kindly for some help and I am not able/ don’t want to fulfil that request for whatever reason, I just can’t go with a blunt No. I then decline in a friendly manner. Probably because it feels better to me when someone is declining my request, but still in a clear and friendly way. I also struggle with household situations, when my partner obviously doesn’t want to participate or do more then the absolute necessary, but doens’t say so or just delays the task at hand. It feels unfair to do more as a result, on the other hand I surly don’t want to ‘force’ anything on him. It’s a strange dynamic and I have a lot to learn on boundaries ! Thanks for sharing here with us! When it comes to household chores most of us don’t ‘want’ to do them -your partner included. And yet they need to get done- the responsibility is both of yours so perhaps re-framing your view of it will help you feel worthy of an equal work partnership. Hello Terri, what can I do if I realize that I am a manipulator? I was raised by two of them and because of this I flip flop between manipulation and not knowing when/how to set boundaries. Thank you for reminding us that NO is not a four letter word! Because I don’t want to…what a gift! Your awareness is the first step to all transformation. What is the opposite of manipulating? Speaking honestly and asking for your needs to be met. The more you de-code what you learned from your childhood, the easier it will be to mindfully choose to interact and communicate authentically. Thank you for being here with us!